Last week I had a class on how to use the Cuttlebug and the many techniques I've learned using the folders. Here are the cards we made in the class. This first one was using the pastels and coloring over the raised part of the image and then spraying it with cheap hair spray to seal it. This seemed to be everyone's favorite card and technique. It was done with Very Vanilla and Certainly Celery and looked so very elegant. We even embossed the envelope flap!! It looks great! The second card was the double folder card. Putting only a portion of the cardstock in the folder and running it through the machine, then turning it around and putting the other end of cardstock in another folder and running it through the machine. We put some simple score lines in first though at 2 inches from each end of the cardstock, then stamped the sentiment, then we ran it through the embossing folders. Afterwards, we put the score lines in and added a second score line 1/4 inch apart. 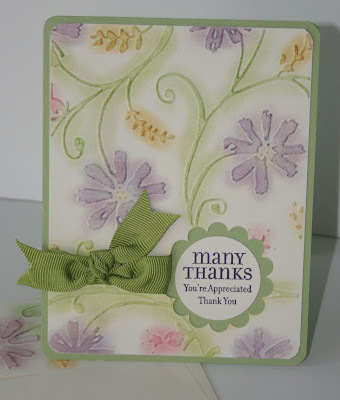 We finished the card off with some of the Boho Blossoms with a Rhinestone brad. This third card was using the Negative Effect. Brayering ink on the top side of the folder and then placing your cardstock in and running it through the Cuttlebug. 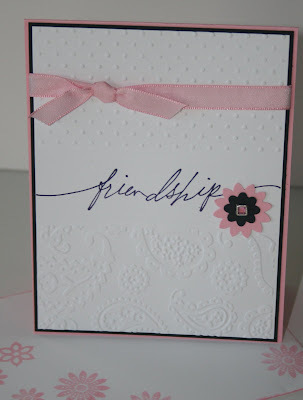 It really gives alot of dimension to the embossing this way. 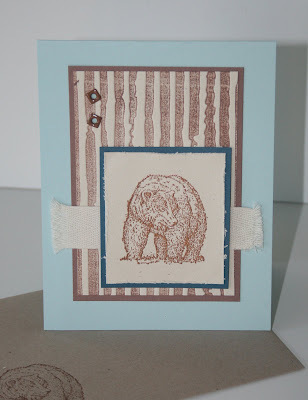 The bear from the set Wild Reserve was heat embossed with Carmel EP from Sparkle n Sprinkle. I used some twine behind the image, I think it is a masculine look, and topped it off with two retired square eyelets. If you have made any cards using the Cuttlebug and would like to share, please send me a copy of the card and I will put them on my blog.